HSV Senator is a low-miler. 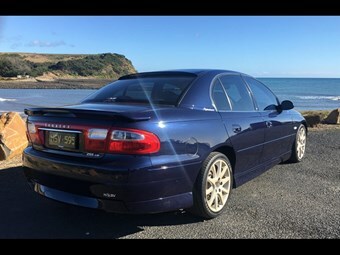 You could be forgiven that you need to be rich to buy a local muscle car, given the recent auction prices for premium collectibles such as early Monaros. However, you don't necessarily have to spend a fortune, as there is some solid buying out there. This car is a good example. There were a couple variants of the Senator released for the VX Commodore series, including the Signature and the 300. This is the former and it looks as though the first buyer ticked a few options boxes while they were on the job. For example it has the performance pack, which upgrades the brakes, wheels, suspension and seats. Under the bonnet tyou have a 6.7lt LS series V8 that claiming a healthy 255kW (342hp) at 5600rpm and 475Nm of torque at 4000, which is enough to add up to a quick car. You had a choice of six-speed manual or four-speed auto and this has the latter. For us the kicker is the car claims under 17,000km of use and a logged service record, which means it should barely be run in. Presentation looks promising and it's located in Tasmania, priced at $30,000.